Andrew Dienes Industrial, Drone Creatures of catacombs... They are not from our world. Their reality is full of gloom and dancing shadows which never saw the light besides the one from smoky bonfire, hiding from the eyes of those walking the surface. They think different than us. They look different than us. They see things different than us. But the bridge between two worlds can be set through communication on the sensual level, for example through the music of a split album of two Russian bands Otzepenevshiye and Vir. Both projects were born during the post-Soviet era of decomposition and degeneration of the great empire when the country was thrown into the abyss of degradation. While Vir started his craftsmanship in Moscow somewhere around middle 90s', the first more or less officially-known release sees the light during 2003. Their fellow countrymen Otzepenevshiye broke into the local scene with their participation in collaboration CD together with Allerseelen and Neutral during 2008. The vision of those two bands can be seen through the prism of their split album 'For A Knife' and allows the listener to feel all the depth of local desperation and cultural decadence. The type of the music that is presented on this record is not new for those that keep an eye on the development of industrial scene from its early stages. Sometimes it seems that the roots are already lost and forgotten, that drone scene has nothing to offer and only the big names like Nadja or Troum can squeeze the juice out of it. But if you take 'For a Knife' and give it a big hug, I am sure, you will not be disappointed. 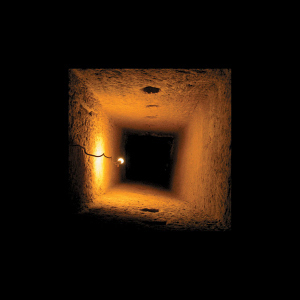 The acid mixture of heavy guitars, industrial special effects and the spirit of catacombs is the winning one for that album for sure. The action starts with the opening ambience of "One Thousand Doors" that dopes my sight with its slow yet deluded flow when the tension is slowly raised by fading in heavy guitars and suddenly explodes on its top with the blast of a structured melody, drumming line and an extreme screaming vocal session. A musty breath of desperation right into my soul, a sip of addled water with a strong taste of rust scratches my throat leaving no light and hope in my heart. The music naturally transforms into "Trench", a totally massive track, where drilling mechanisms are guided by a deep synthetic background and mystical melody; a heartbeat of industrialization. The third composition "Sonne Der Toten" balances on the edge between drone doom metal and deep shoegaze with heavy riffs and drumming machine where the light melody is responsible to keep the track atmospheric, the exact piece for Nadja fans. The artists take a break with "-273" , the absolute zero temperature, a kind of transitional track, where floating solo guitar riffs rules the scene and creates a chilling atmosphere of icy planes. Don?t fall into relaxation too fast and get yourself back to a dirty reality, because the fifth composition "Black" captures the imagination with a ritual of mechanical erection, the deep penetration of drilling mechanisms into the bloody womb of natural destruction when the heavy guitars are back to jerk out on the violent screaming. The impression was ruined a little bit by a short playing time of this track, it could also be much better by adding even more violence into it using some metal parts scratching or petroleum drums hitting or something like that. But instead of it, the sudden change in mood brings a slow and mysterious "Ce Qui Ne Trompe Pas", which is alright track without any special high or lows. The final "For a Knife" has more or less the same atmosphere as "Sonne Der Toten" to carry the wave of sound towards the end of the album and to finalize one of the most surprising releases of Russian scene during last few years. Creatures of catacombs... They are not from our world. Their reality is full of gloom and dancing shadows which never saw the light besides the one from smoky bonfire, hiding from the eyes of those walking the surface. They think different than us. They look different than us. They see things different than us. But the bridge between two worlds can be set through communication on the sensual level, for example through the music of a split album of two Russian bands Otzepenevshiye and Vir. Vir and Otzepenevshiye don't discover anything new; all the techniques are well-known to the listeners that are familiar with that kind of music. Sometimes few parts are predictable and not mastered too much, but the special energy and impulse compensate the disadvantages and carry those artists towards their goal of creating a good spiritual material. I would like to single out "Trench" and "Black", the two tracks that are the strongest compositions of the whole album for my taste. But all the rest are interesting enough to give them a try too. So, hurry up, go find the door to your private catacomb.